As Christmas is coming around the corner, I know most of my friends are getting ready for celebration. How do you celebrate this year? Me, I might cook some special dishes or go for parties. I won’t feel a Christmas dinner be a fulfillment if without any dessert. I think this special dessert, pandan panna cotta will suit Australia’s hot Christmas. Yes, I know, panna cotta is a well-known Italian dessert, only cooked with milk and cream. I tried to add an exotic twist by infusing the custard with the delicate fragrance of the pandan leaf. 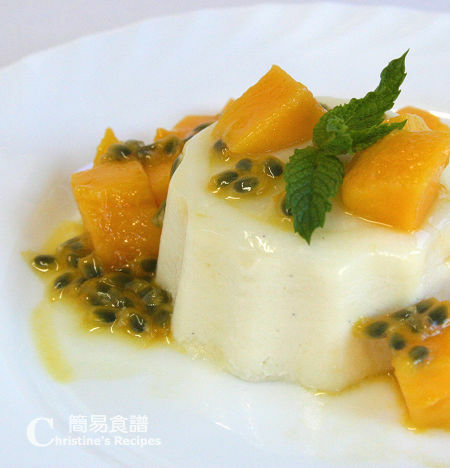 By mixing the Australian mangoes in season with tropical passionfruit, the taste of the dessert turned out to be so unique and super delicious. Put 3 tablespoons of water in a bowl. Sprinkle gelatine powder evenly over. Leave the gelatine to sponge and swell. Add the milk, coconut cream, sugar and pandan leaves in a small saucepan. Heat over low heat and simmer for 10 minutes to infuse the flavours. Be sure not to boil the milk. Remove from the heat and leave to infuse for another 10 minutes. Discard the pandan leaves. Add in the sponged liquid to the warm milk and stir until completely dissolved. Strain the milk into a bowl through a fine sieve and chill in fridge until half set. Whip the cream until soft peaks form. No need to beat too long. Gently fold the whipped cream into the milk mixture and pour into six jelly/custard moulds. Refrigerate until completely set. Combine the mangoes and passionfruit and mix well. To serve, briefly dip the base of the moulds into hot water, then turn the panna cotta out onto individual serving plates. Drizzle with mango and passionfruit and garnish with a mint leaf. I was not able to find any fresh pandan leaf here, so just used the frozen one. Still good in smell though. 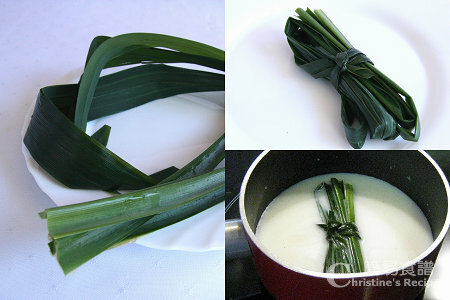 If anyone can’t get any pandan leaf, substitute 1 teaspoon of pandan essence in the milk mixture to give a kick if desired. Fusion! Very nice Christine! But the pandan leaves in Australia are never as fragrant as those back in Malaysia, you reckon??? What a unique panna cotta with coconut cream and pandan leaves! Just perfect served with the tropical fruits! Excellent! This dessert looks mouth watering. I love the taste of passion fruit. They're one of my favourite fruits! 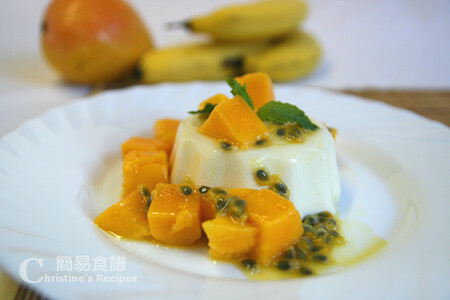 Your panna cotta is very special with pandan leaves : ) Love also your fruit addition with mango and passion fruit, very refreshing! Oh this sounds so good, and I've never used pandan leaves - now with this recipe, I have no excuse - thanks for sharing! Panna cotta with pandan? Brilliant idea - you are totally right - it gets so hot here in Australia that something refreshing like this would do the trick! Thanks for sharing. This is a keeper. I want to make almond panna cotta. I just love pannacotta. I know it is all cream BUT who cares for now. yummy...gonna try tis out ,i m staying in malaysia,may i know whats pouring cream ? is whipping cream ? Pouring cream is also called single cream, that's not rich in fat. I used AustralianPauls pure cream, very natural and runny. To make this dessert, you might get whipping cream with less fat at your local store. Check out the ingredients at the back of its packet. This dessert looks delicious indeed, love the pandan in it. Coconut cream, pandan...I know this has to be my favourite. Just look too delicious! Tksss. ..alot .. will find out .. This is lovely!!! Congrats again!!! Have you ever tried kiwi flan with pandan twist? This is beautiful! Great flavours! I love the mix of the sweet of the mango and the tart of the passionfruit. Gorgeous combination. What does pandan leaf taste like?? The recipe looks great! I found you through Tastespotting, your one and only beautiful picture! Your gallery will be full before I can say 'Panna Cotta'! Congratulations and great clicks! Yeah, I tried to submit my favourite picture to Tastespotting yesterday. Glad that they accepted it. Love your recipes. I wonder do you have a recipe on how to make 千層糕? Thanks. hi, when you say half set, the mixture should still be in liquid form? Yes, you're right. The mixture should still be in liquid form so that it can easily combine with the whipped cream.